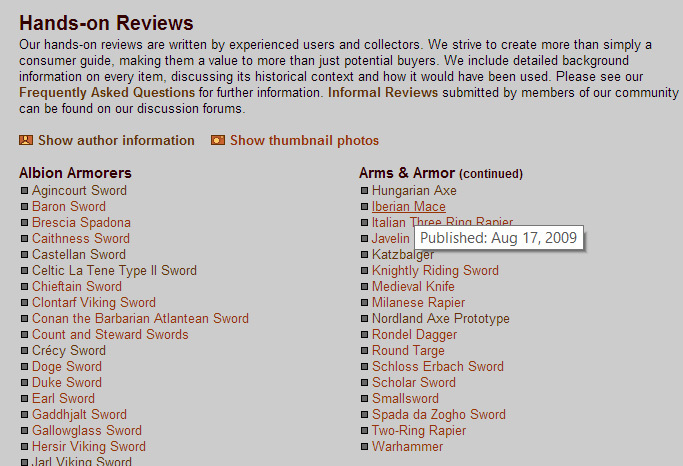 Forum Index > myArmoury.com Features Talk > why no dates on reviews and features? Posted: Wed 21 Aug, 2013 8:25 am Post subject: why no dates on reviews and features? I have been assuming that there is a good reason that the reviews and features on this excellent site are not dated. I tried to search for a thread on the subject but did not find one. I apologize if I simply missed it. Can anyone speak to this? Not everything has a publication date. We started to do that later in the history of this site. For the reviews that have publication dates, you can mouse over the review name in the list of reviews and a date will pop up and be visible. For members who are logged in, the publication date is also at the bottom of the article, when available. Thanks. I am embarrassed that I missed or forgot that. Maybe I should lay off the coffee and try sleeping more. It's way too subtle! It's not you. It's us.